I’ve never been so happy to see a rainbow trout in my life. 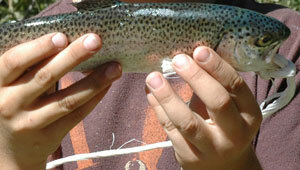 It was the first-ever fish for A., caught at the tail end of an excellent camping trip at Silver Lake. It was also very welcome proof to my 8-year-old son that his old man knows a little about fishing after all. We were only there for a night, camping just a cast away from the deep, cool water. We fished a little the day we arrived, but caught nothing. The next morning, I woke the boy up before sunrise, and as mist hugged the lake, we cast big gobs of yellow sparkle and rainbow PowerBait into the water and waited. We sat and sat, but no luck. It was chilly as the sun rose over nearby Sierra peaks, and I could tell that shivering A. had his doubts about whether I knew what I was doing. I admit that I’ve laid it on pretty thick when it comes to fish stories, going on and on about days near Mammoth where I used to catch so many fish that my arm got tired from reeling them in. A. was pretty quiet as we made our way back to camp, where we ate cereal bars instead of fresh trout for breakfast around the campfire. Later that morning, we went kayaking on the lake, which I figured would be a pretty good diversion from fishing. But as we paddled not far from our fishing spot, we watched as a dad helped his daughter reel a fish to the shore. The girl couldn’t have been more than 4. A. watched the scene unfold from his kayak, and then shot a look at me that could have frozen that fish on the spot. I knew I had my work cut out for me. Pretty soon it was time to break camp and head home. I figured we had one last chance. Getting A. back to the lake to go fishing again took a lot of convincing, but he reluctantly toted his gear back to the shore. I baited his hook and handed him the pole. He splashed his way out to a big granite rock just off shore and cast his line. The waiting began. In the meantime, I set up my own pole and cast my line. We sat quietly. I knew this was it. As I looked away and tried to think good thoughts, the fishing gods smiled upon us. At first I thought he was pulling a fast one, but before I could get out to the big rock where he was standing, he had already reeled the beast in. The trout flopped around on the line. Determined not to let this one get away, I grabbed the fish around the middle. It was the most beautiful trout I’d ever seen. We measured it: 10 ½ inches. A.’s grin was just as wide, and he immediately recounted every detail of the catch. In his eyes, he’d caught a whale. We made our way back to camp, with me carrying the fishing gear and A. holding up the stringer, proudly showing the fish to folks we met. He was elated, and I was just plain relieved. He finally caught a trout, and I managed, just barely, to maintain a little bit of dad cred. There’s a gravitational pull between boys and dirt. It’s impossible to keep the two apart, as we found out Saturday during a fishing expedition to Jenkinson Lake at Sly Park Recreation Area near Pollock Pines. We set out from Sacramento at about sunrise, two dads and two boys packed into a minivan for the hour-long drive up Highway 50 to the foothills. Anticipation built up for days in advance of the trip. This was, after all, the first real fishing attempt for 6-year-old A. On Monday, we went out and got a fishing pole for A. We picked out pink and yellow PowerBait and some salmon eggs. On Wednesday, we put a bobber on the end of the line and practiced casting on the grass in the back yard. I spend a good amount of time untangling the bobber from a nearby tree after errant casts, but A. showed a lot of natural talent. On Friday, we got a couple cups of night crawlers. We were all set for the big day. We got up a little after 5 a.m. Saturday, met up with our fishing buddies and rolled into Sly Park at about 8 a.m., ready to find fish after fueling up on pancakes in Placerville. We quickly found a spot at the north end of the lake, along a stretch of shore near where a little creek enters the lake. The scent of pine filled the air, and the nearby trees cast long shadows over the little cove where we sat. This place showed promise. A. was eager to cast, and flicked a line with a bobber about 50 feet off shore. It was now time to add a leader, hook and a little bait. But in the time it took me to rig up his line, the call of the dirt and the water already had a grip on A. and his 7-year-old friend, T.
A. told me to cast for him, and to let him know when a fish grabbed the bait. He and T. had exploring to do, and they were off with nets looking for critters to catch. They laughed and splashed and threw rocks into the lake. Both were as happy as any kids I’ve ever seen. This was fine with me. The dads just kept on fishing. The boys were soon both soaked up to their necks from exploring the lake. Their wet clothes were a magnet for dirt, and both kids looked like grizzled mountain men returning from a six-month trek through the forest. Each was covered with a crust of dust. Maybe this was how the boys from the caveman times did it, protecting themselves from mosquitoes with a layer of crud. We got skunked by the fish, but the boys didn’t care. We drove east to a spot on the lake near Hazel Creek Camp for lunch and more looking around. That’s where A. caught his first fish, a little 2-inch thing near the shore. With is bare hands, no less. He and T. both checked it out and set it free. Maybe next time it will be all grown up and A. will reel it in on his own.